Meet Glenn “SmittyG” Smith, a bassist from Texarkana who can play the spectrum of music from country to punk to jazz and everything in between. The reader spotlight is one of our favorite features on No Treble, and it is people like Glenn who really make it extra special. I’m sure you’ll enjoy his sense of humor as much as we did. Not to mention his impressive range of music and gig experience. Glenn is our player in the spotlight for November 22, 2011. Be sure to drop him a note in the comments and say “hi”. I’m an Army brat who wound up dropped off in Texarkana with a love for large variety of experimental and improvisational music and absolutely no local market for it. Add to that I have a wife and two kids in school, and I’m the only provider, and you have the perfect storm to create one frustrated musical artist. I am an out of work database engineer who currently can only find work as a bookkeeper/accountant. (Yep, I’m just lovin’ the economy right now.) I also work part time at Mic’d Music in Texarkana to support my string habit. I just got hired on as the bassist for Ms Mac and the Groovetones. We do classic rock with a focus on Heart, Fleetwood Mac and Joan Jett. I use a Hartke 112c HyDrive combo amp. While I have a lot of pedals, I almost never use them live. The exceptions are a Seymour Duncan Paranormal DI that was given to me by Bass Player Magazine for a quick lesson of mine they published, and my Digitech Jamman loop pedal. On the bass side, I have a Fender Standard Jazz Bass loaded with EMG JX pickups, an Ibanez SR405 five string, and a relic’d (yeah, I said I would never own one of these things) Indy (Indiana) custom shop jazz style bass with the best neck I’ve ever touched in my life. My strings are all over the map. I’m still looking for a favorite. I took his words to heart and never looked back. I guess that would be that I have the ability to drop into a band with little or no prep time and get the show done. Most of the bands I’ve been hired to play in, my introduction to the group came with an unexpected departure of a bassist (or, in Ms Mac’s case, an unexpected shoulder injury that left her unable to play bass for a full gig). I have had as little as six hours notice and up to two weeks, with the most common being about one to three days warning that I’m needed. I have done blues gigs, country gigs, rock gigs, punk gigs, jazz gigs, cover bands and all original bands. A good ear and deft fretwork have helped me get the job done. I started out with Steve Harris (Iron Maiden), Geddy Lee (Rush), and John Taylor (Duran Duran). But I never played like them – my fingers just ain’t that fast. Then moved on to Stanley Clarke, Jeff Berlin and Dann Glenn. I can’t play like them either. Lately, I listen to a lot of solo musical artists like Michael Manring, Steve Lawson, and Trip Wamsley. Nope, can’t play anything like them (I wish). But if I had to narrow it down to the ones who really showed me what to do with the instrument in how I use it on my primary gigs, I would have to go with Carol Kaye, Todd Johnson, and local bass hero Jimmy Sparks. 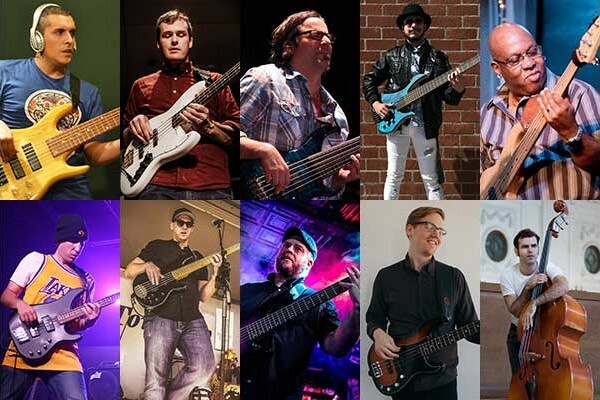 Of course, I could just name every bass player on the planet! I do my best to learn from everyone. I can certainly vouche for the amazing abilities of Mr. Glenn “SmittyG” Smith. Met up with him on Texarkanarocks.com music forum several years ago and heard about the band he played with, Deacon Dark, and was blown away with them. At that time I was a new bass player and learned alot from listening to his bass lines from Deacon Darks “Wet City Streets” album (check it out on Soundclick). All around great musician and person. Well, well. Learn something new everyday. Way to go Smitty! Heard Smitty play off and on for years and he’s a wonderful bassist. So happy to see this publication about one of “our own”….he’s great! Someone else who knows what a difference Todd Johnson has made… Fascinating reading, Smitty – thanks!